you wish to come for a monastic experience or for a short period of prayer or need a breathing space? Monastic Hospitality: presence of Christ, mystery of salvation. Hospitality is typical of the Benedictine charism. Every guest is Christ himself that comes in the monastic community. Lord's face is the face of every person who comes among us, who wants to meet us and walk with us. Monastic community offers a simple but decent accommodation, we are always attentive to guest's needs. 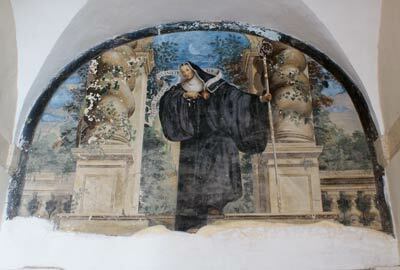 Our hospitality becames Charity and our heart is open to all those who knocks the monastery door. Everyone who opens his heart to Christ not only understands the mystery of his own existence and vocation, but can also grow wonderful fruits of grace. Guests are accommodated by our two guest quarters: the internal one, that is located inside the monastery and is reserved to men only, and the external one. In the inner one, consisting of 6 rooms, we can accommodate priests, religious, and anyone wishing to have a monastic experience. In the outer one consisting of 8 multiple rooms, we can accommodate mixed groups wishing to spend one or more days of prayer and reflection about Christian life. More info are available calling or sending a fax to +39 0765 277152. You may also send an e-mail to the Father Prior: farfenprior@libero.it. 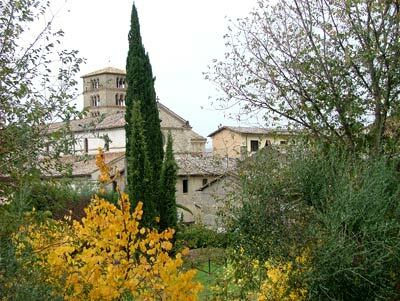 Large groups may contact the International Bridgettine Centre of Farfa, just beside the Abbey.